In early April, our team had the privilege of touring a special school where miracles happen every day. It was the International Academy of Hope (iHOPE) in New York City. iHOPE is a school for students with vision, speech, hearing, and physical impairments due to a traumatic brain injury. They are non-verbal and their physical movements are severely limited. In many ways it was so sad to see these children who struggle to accomplish even simple tasks. Yet by the end of the tour, our overwhelming emotions were admiration and hope. As we met the students we quickly realized that each of them had thoughts and feelings they want to express but cannot. Rather than accepting this, the staff at iHOPE, with the help of specialized technologies and hard work from the students, are discovering creative methods for the students to communicate, learn, and experience fun and games. We were amazed by what we saw. We met a young teenaged girl named Allegra. She had just crossed a life-changing milestone that simply began with her ability to move one thumb. With a custom designed switch that controls a cursor on a screen, a whole new world opened up to her once she could move her thumb at will. She could now use the cursor to respond to simple questions. She could tell others how she was feeling that day, what she wanted to do, or whether she was hungry or thirsty. 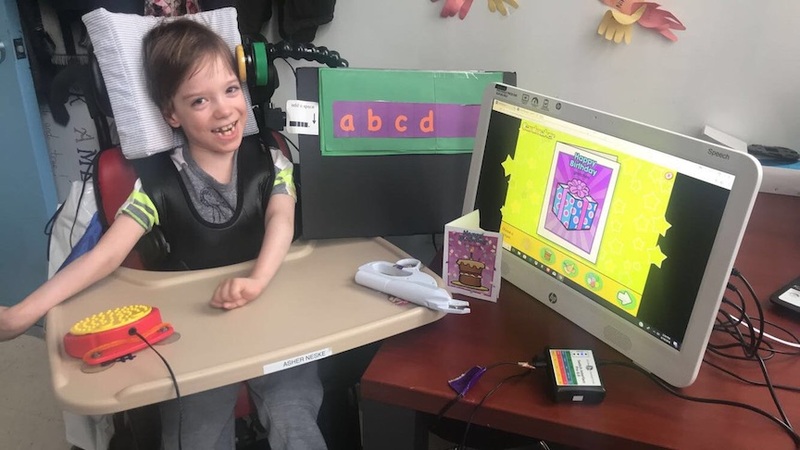 Our tour guide, Gretchen Hanser, Director of Assistive Technology, described the reaction of Allegra’s mom when she realized that her daughter now had a way to communicate. Imagine the new possibilities this opened up for Allegra and her family! Allegra's mom just began to cry. We also met Gabriel. He can’t use his hands and also needs to use switch technology. iHope staff taught him how to use a “SCATIR” switch which controls his now favorite computer game, “Bumper Cars.” His switch, attached to the side of his glasses, is triggered by an eye blink. Despite his limitations, Gabriel can finally play a game like other children. We also met Maria who uses a communication device controlled by her eyes. She looks at a particular square on the screen and those words are then spoken by the computer. She was able to ask us how we were doing. She had a huge smile as she interacted with us, clearly happy to have visitors. Unfortunately, traumatic brain injury (TBI) is more common than most people realize. According to the Center for Disease Control and Prevention, approximately 5.3 million people are living with a TBI-related disability in this country. Schools like iHOPE are critical to help these children discover and achieve their personal best. iHope opened its doors and began enrolling students in September of 2013 with funding from the Sarah Jane Brain Foundation. iHOPE serves as a world-class model of best practices and high-tech solutions in the delivery of education brain injury services. The goal is to establish a network of nonprofit, nonpublic schools, called International Academies of Hope, in major U.S. metropolitan areas and abroad. As we left the site visit we agreed that the name, iHOPE Academy was absolutely perfect. The students and families at iHOPE need solutions and hope and they have finally found both. We were honored to approve their grant request for $116,765 to cover the costs for new state-of-the-art equipment to aid in the students’ mobility, communication, care, and education. As we left our tour, we exchanged stories and perceptions. We talked about a sweet little girl named Christina whose personalized communication device enabled her to actually have a conversation with us about her family. It was a memorable tour of a remarkable school. Learn more about iHope Academy here.